My Impressions: Simon Says Stamp Thankful Squirrel Card (using Simon's November Card Kit + a GIVEAWAY)! Simon Says Stamp Thankful Squirrel Card (using Simon's November Card Kit + a GIVEAWAY)! I'm back today with another card made using the Simon Says Stamp November 2015 Card Kit: Handmade With Love! First, I stamped the Grateful sentiment with Simon's Cloudy Sky Dye Ink repeatedly onto Simon's Sea Glass Cardstock. I added a few strips of the Pebbles Inc. Harvest 6x6 Papers to the bottom and die cut the panel using the rectangle die from Simon's Bundle of Stitches Dies. Once again I used one of the fabulous Pebbles Harvest Chips Printed Cardstock Shapes (the cute little squirrel) and adhered it to my card with foam adhesive. I die cut some hearts from Simon's Burnt Orange Cardstock using Simon's Large Holiday Shapes and Holiday Shapes Dies. I then coloured them with my R29 Lipstick Red Copic Marker to better match the rest of the card and stamped 'Thank You' with Versafine Onyx Black Ink Pad. The largest heart was adhered with foam adhesive and the smaller ones with an adhesive tape runner. Finally, the panel was adhered to one of Simon's White A2 Side Folded Cards. Just a reminder, you can pick up the Simon Says Stamp November 2015 Card Kit for just $29.95 + shipping. If you'd like to receive this kit and future kits for only $24.95 + shipping per month, you can SUBSCRIBE HERE. Heidi, sweet owner of Simon Says Stamp, has given me an extra Simon Says Stamp November 2015 Card Kit to pass on to one of you! Just leave a comment on any or all of my November Card Kit blog posts and I'll announce a winner Monday, October 26th. So sweet! Love that stamped background with the little squirrel! Love the way you combined different elements from the kit. That squirrel is a cutie! 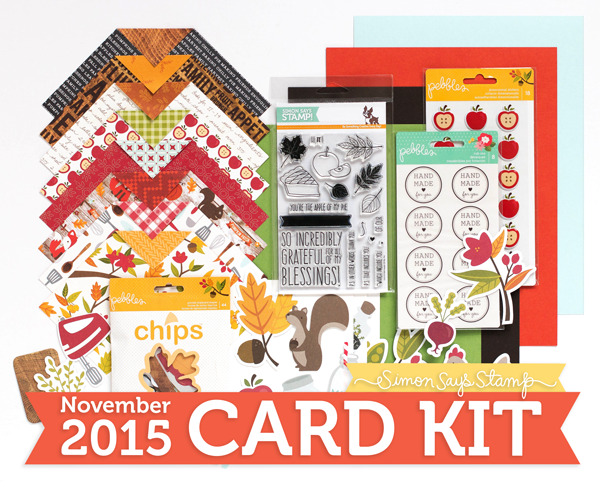 Your card is so cute, love the Pebbles chips and colors in this kit. I have never seen those chips! This card just makes me smile! Love the new SSS kit! Ooooh! Your card is beautiful and your squirrel is so sweeeet! I love it! This SSS card kit is so lovely! Thank you for the inspiration! what a cute squirrel card ...love the papers and design. Wow that is one cute card, love it. The squirrel is delightful!!! Little squirrel reminds me of my husbands lil buddy who eats bread or cookies from the hubs hands...so sweet. Your thank you card is adorns. This is a wonderful kit! Love the sayings! Your card is really sweet! What an adorable card! This looks like a fabulous kit. love the backgrounds on this! Oh my gosh, love that darling squirrel, Sarah!! Thanks! Paulette S.
So cute!! Love the squirrels & all the great colors in this one! So cute, really love your card! Very cute! Great color combo and I love the squirrel. oh my! This card is super cute and adorable! Love the printed paper for the background and the squarel! Such an adorable card!! I love that Sea Glass colored cardstock. I am loving this kit and that squirrel is adorable! Love the background stamping too! Another awesome card, Sarah - great inspiration and use of the new kit. Awwww what a sweet little squirrel! So adorable! Thank you for the great ideas in the card! Simon Says Stamp November 2015 Card Kit Winner! Simon Says Stamp Create Joy Blog Hop! & GIVEAWAY!